The Peregrine Fund has been studying the Ridgway's Hawk since 2000. Biologists began by searching for individuals and breeding pairs in many places around the island of Hispaniola. Through these initial surveys, they realized that the only remaining population was in Los Haitises National Park and began to focus their efforts there. Biologists spend long days in the field, hiking for many hours in an attempt to visit all the known nest sites and to find new ones. At each nest, biologists observe the birds to learn more about their behavior, what they are eating, how often they feed their young, and all sorts of other interesting things! Biologists also climb into the nests to check on the young chicks, treat them for botfly infestations, or place bands on their legs. Banding birds is a way for biologists to learn how many young survive each breeding season and to gather information on how far and where they travel after leaving their parents' territory. When necessary, biologists also climb the palm trees if they notice that a nest is beginning to fall. This happens naturally when the palm fronds that sustain the nest get old and peel away from the main trunk. If this occurs, biologists temporarily support the nest with sticks and rope. Though not a long-term solution, it keeps the nest intact long enough for the young to grow up and fly from the nest. 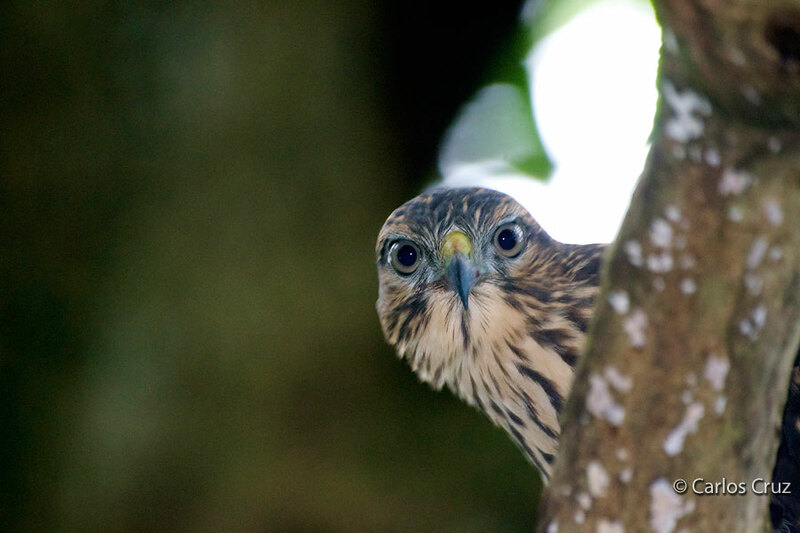 In 2008, The Peregrine Fund began releasing young Ridgway's Hawks on protected private property outside of Los Haitises National Park in the Dominican Republic in the hope that these young would grow up, find a mate, and begin to raise young of their own. 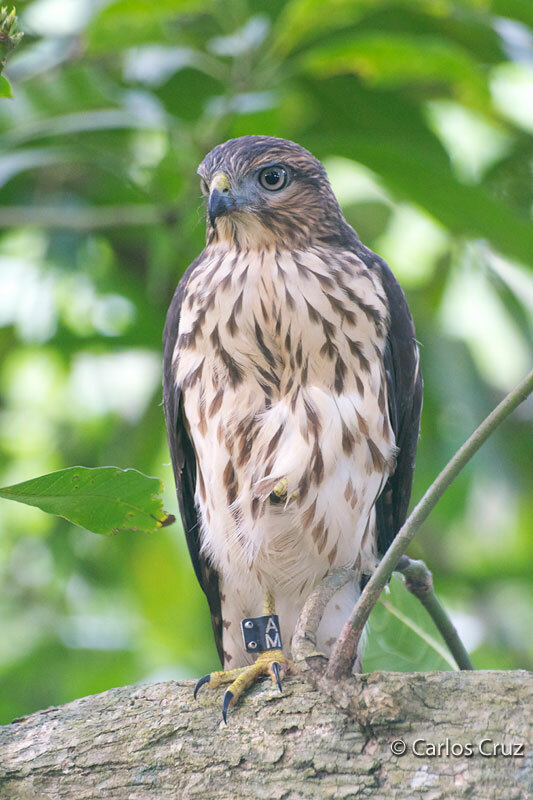 By doing this, biologists are helping to create new populations of Ridgway's Hawks outside of Los Haitises National Park. That way, if a hurricane or disease does hit, the chances are greater that some individuals or even whole populations will survive. Our efforts are paying off! 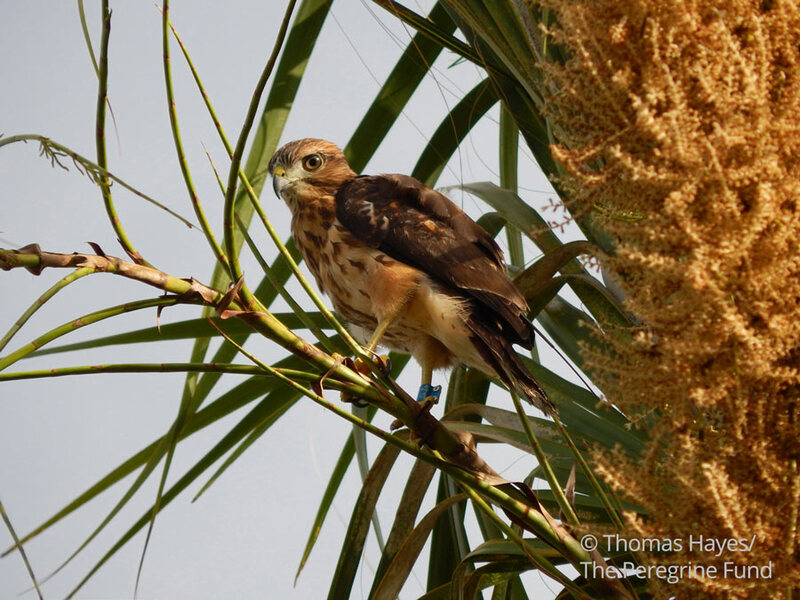 In 2013, biologists documented the first known pair of nesting Ridgway's Hawks outside of Los Haitises National Park in decades. Another important part of our conservation efforts is environmental education and community development. We have been working with local community members to teach them about the importance of this hawk, to train some as field biologists, and to provide information to as many people as we can about this endangered bird of prey. The more people who know about it, the more people there are who are willing to protect it. In conservation work, gaining the support of the people who share the environment with wildlife can be just as important as the field work carried out to study the species. 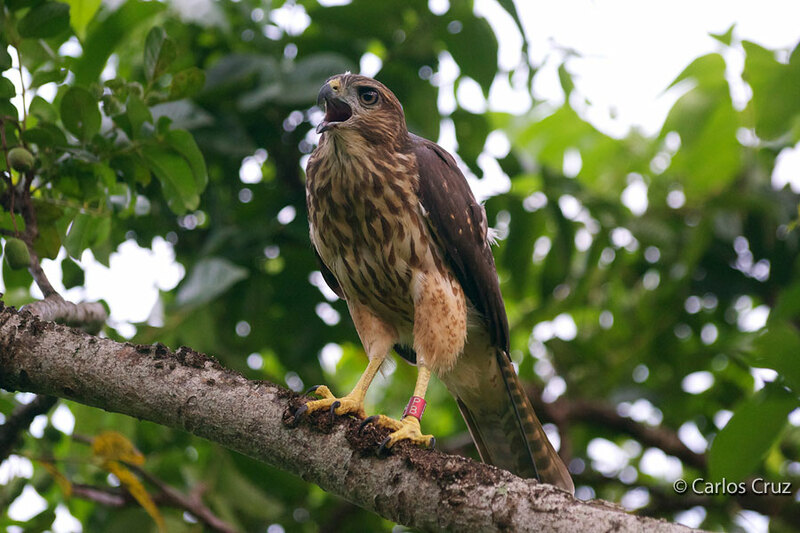 The Ridgway's Hawk lives on the island of Hispaniola, which is shared by the nations of Haiti and Dominican Republic, and a few outlying islands in the Caribbean Sea. 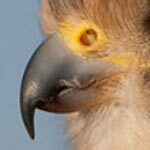 This means that the Ridgway's Hawk is found only in this small region and nowhere else on Earth! Today, this hawk's range has shrunk even further. The only known breeding population is found primarily in Los Haitises National Park in northeastern Dominican Republic. Biologists have not recorded this species in Haiti for more than 20 years, and it is believed to be extinct there. Although this species appears to prefer undisturbed forest in lowlands and foothills, it lives in a wide variety of habitats, including rainforest, subtropical dry and moist forests, pine forest, limestone karst forest, and woodlands. It even is found in human-altered habitat, including plantations, degraded forest fragments and pasture lands. This ability to adapt and survive in different types of environments is good news for the species! As long as adequate prey and nesting sites exist, the Ridgway's Hawk has a good chance of surviving even in areas that have been dramatically changed by people or by other factors. This medium-sized hawk has broad wings and a relatively long tail, allowing it to maneuver deftly through thick forest. However, it also spends a lot of time in open areas, sometimes perching low to the ground as it scans for prey. The Ridgway's Hawk also likes to soar and can be seen flying among Turkey Vultures or all by itself high in the sky. Unlike many raptor species that are sensitive to human activity, the Ridgway's Hawk is not shy around people and sometimes can be found nesting in small patches of land very close to settlements and roads. If people get too close to its nest, however, this hawk is quick to defend its territory against them or any other potential predator. It vocalizes loudly or flies swiftly after the perceived threat, stooping and chasing it to a safe distance away from the nest and young. Often, both the male and female work together to chase off intruders. 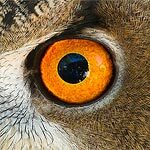 Apart from their alarm call, which is a high-pitched wail, Ridgway's Hawks have a wide array of calls. They are a vocal species and this makes it relatively easy for biologists to locate them in the forest. Since the late 19th century, the Ridgway's Hawk population has been in steep decline. Much of their native habitat is disappearing through clear-cutting of forests and wildfires, and many individuals are being shot or taken from the nests as chicks by people who eat them or kill them for fear that these beautiful hawks will prey on their chickens. In addition to these two main threats, other factors could be affecting the hawks' ability to survive. 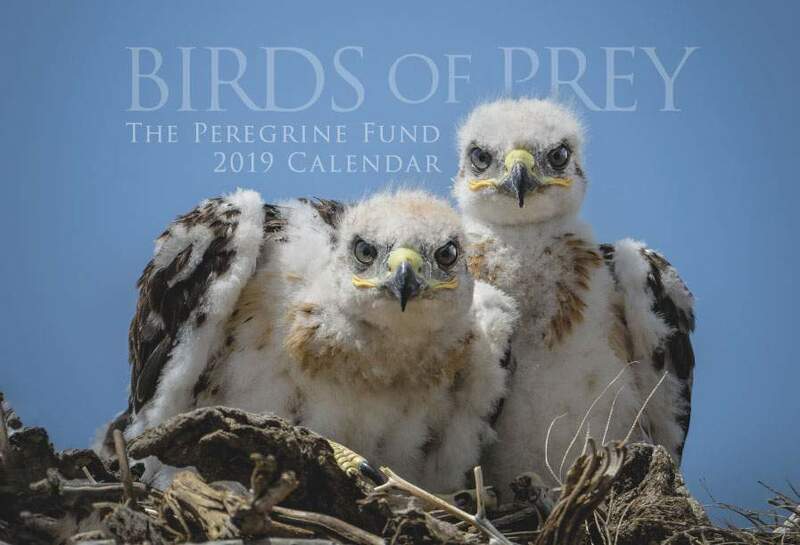 Peregrine Fund biologists working with this species have found that the nestlings are often infested with botfly larvae, blood and tissue-eating parasites that can sometimes kill the young birds if they aren't treated. Biologists don't yet know if this fly's population has increased due to human-related changes in habitat, climate change, or cyclical population fluctuations, or if it has always been present in such large numbers. Historically, Ridgway's Hawks nest in hardwood and palm trees. 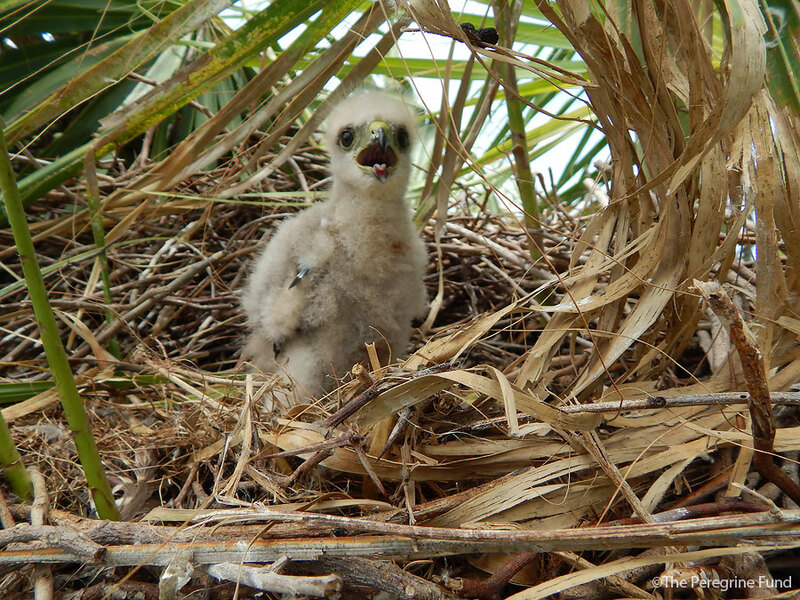 Today, with fewer and fewer hardwood trees still standing, the hawks are nesting almost entirely in palm trees. While these are great nesting sites, they do present a problem. The palm fronds naturally peel off and are shed throughout the year. If the palm fronds supporting the nest fall away while there are still eggs or very small chicks inside, this could mean trouble. If the eggs or young fall to the ground, there is very little chance they will survive. Because the population of Ridgway's Hawks is small (an estimated mere 300 individuals remain) and isolated (found only in one area), this species is at a greater risk for extinction. If a hurricane or disease were to sweep through the area, the entire population could be wiped out at once. If such an event were to occur, the species would be lost forever. Ridgway's Hawks are not picky eaters. 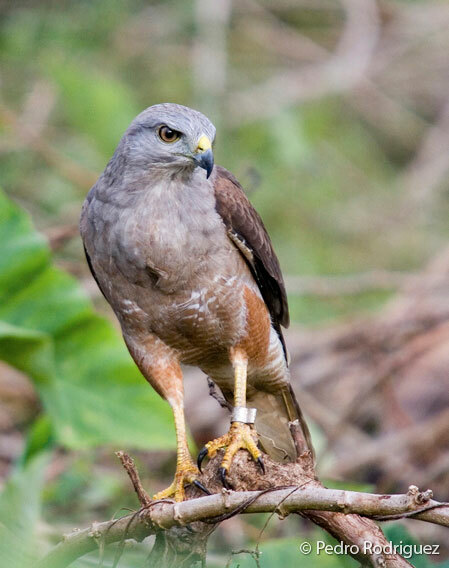 Unlike the Snail Kite, whose diet consists almost entirely of apple snails, the Ridgway's Hawk eats just about anything small enough to catch. They feed on snakes, such as the green vine snake, as well as lizards and skinks, frogs and toads, small rodents, bats, and birds. In one study of 20 nesting pairs, biologists documented that reptiles comprised 97% of the prey items. That's a lot of snakes and lizards! Ridgway's Hawks are patient hunters. Unlike some other raptors who fly high in the sky in search for food, these hawks spend a lot of time perched in relatively low snags or branches. When prey is spotted, they dive after it, often snatching it up from a log or directly from the ground. During nesting season, and perhaps all year-round, these hawks sometimes cache, or store, food to be eaten later. This saves them time and energy and allows them to take advantage of an easy catch, instead of letting it escape because they aren't hungry at the moment. It is like a person buying enough groceries for several meals, rather than going to the store every time hunger strikes. Like many other raptors, the male Ridgway's Hawk often brings prey to the female during courtship. This helps create or strengthen the bond between them – an important factor for a successful nesting season. Though the male often consumes part of the catch before bringing it to the female, sometimes he will allow her to eat first and then finish off her leftovers. On one occasion, biologists observed a male flying into his territory with a thin, black snake in his talons. He placed it in a tangle of vines at the female's feet. At that point, both the male and female began feeding on the snake, one bird at each end – almost like the dogs eating spaghetti in the movie "Lady and the Tramp"! During nesting season, the male does most of the work building the nest. He carries branches and twigs in his talons or beak and carefully arranges them into a platform of sticks. His efforts help to create a safe, comfortable place for the female and the nestlings. These hawks usually build their nests high up in hardwood trees or palm trees, such as the royal palm. In fact, royal palms are very popular nesting sites for other endemic bird species. The Palm Chat, the national bird of Dominican Republic, builds its nest among the palm fronds. Then the Ridgway’s Hawk comes along and builds its nest right on top of the Palm Chat nest. These palm trees also often have excavated holes containing the nests of the Hispaniolan Woodpecker. In 2012, one royal palm contained a Ridgway’s Hawk nest, a Palm Chat nest, a Hispaniolan Woodpecker nest, and bats roosting inside the hollow trunk. Talk about a popular place! When breeding season is in full swing, the female lays one to three eggs (usually two) that are cream-colored and mottled with orange-red spots. Now it is the female's turn to work hard. She does most of the incubating, which requires long hours of sitting and occasionally turning the eggs. When she leaves the nest to feed or stretch, the male might briefly take over the incubation duties. The eggs are incubated for about 35 days before the young hatch. While the female is incubating and after the chicks hatch, the male is responsible for catching enough food to feed himself, the female, and their young. When he arrives with prey, he often vocalizes loudly, signaling to the female that it is time to eat. The female shares the catch with the young, tearing off small pieces of meat and delicately feeding them to her nestlings. The Ridgway's Hawks chicks grow fast and in 40-50 days they are ready to fledge, or fly for the first time. The young hawks remain in their parents' territory for about three months before flying off and looking for a territory of their own. The World Center for Birds of Prey offers fun ways to learn about birds of prey. Interactive activities, tours, interesting videos and a children's room with activities from coloring sheets to quizzes to costumes and a touch table are available for the curious mind. We also have several birds of prey on display year-around. Knowledgeable staff and volunteers are on hand to answer any questions you may have about Ridgway's Hawks or any other birds of prey.